The African American Performing Arts Community Theatre opened its production of James Baldwin's The Amen Corner at the African Heritage Cultural Arts Center on February 20, 2013. Self-anointed Harlem store front preacher Margaret Alexander is the leader of her flock and about to see her world crumble. Teddy Harrel, Jr. directed a cast that included Sarah Gracel Anderson, Leondra Mitchell, Yvonne Strachan, Jeffery Cason, Jr., Lamar Hodges, Toddra Brunson-Solomon, Regina Hodges, Adrian Bell, Carolyn Johnson, Brandiss Seward, Janet “Toni” Mason, and Hasani Morey. The African American Performing Arts Community Theatre (AAPACT) and artistic director Teddy Harrell Jr. have put together a lively production of the play, enhancing it with the kind of roof-raising gospel music you’d hear in the storefront Harlem church where its main character preaches. The production and the play itself are hardly flawless... the talent levels of the actors vary and Baldwin’s lengthy script would doubtless be surgically streamlined if the playwright were crafting it today instead of nearly 60 years ago. Even so, there’s plenty to savor in AAPACT’s The Amen Corner. Director Harrell gets absorbing, layered performances from the best actors in his cast. Seward finds Margaret’s stern power but also conveys her doggedly repressed emotions as her life starts to crack. Janet “Toni” Mason is a supportive sidekick as the preacher’s sister Odessa. Gainey makes Luke a charmer, a physically weakened man who is stubbornly strong in his feelings for the woman who left him. As Brother Boxer and Sister Boxer, Hodges and his wife Regina are a formidable pair, evolving from dissatisfied parishioners into gossiping enemies. Carolyn Johnson is a comedic firecracker as Sister Moore, an older woman in cahoots with the Boxers. And Cason effectively conveys David’s tension as he’s torn between obedience and forging his own path in life. AAPACT’S ambitious undertaking is an earnest and heartfelt production laced with chuckles and tears under director Teddy Harrell Jr.’s leadership. But it’s a mixed bag: Most of the time, the characters and their tragic spiral simply don’t feel genuine or organic. These are actors acting, not being. But every 20 minutes or so in this 2 ½-hour evening, the actors dig into their marrow and slingshot the play from pedestrian performances into an affecting truth that clutches the audience’s heart. commitment to serious African American work that redeem its flaws. to embrace and deliver the varying rhythms is one of their strengths. The performances here are not especially subtle or complex – fortunately Baldwin’s script inserts those assets. But they are sincere and exude a restrained passion. These qualities are especially evident in Seward’s portrayal of Margaret, who doesn’t shy away from creating an admirable altruist undercut like Hamlet by a fatal flaw, in Margaret’s case that pride born out of her complete and utter sacrifice of anything that doesn’t link directly to unquestioningly serving the Lord. ...the finest, most consistent and believable performance comes from Carolyn Johnson as the obnoxiously self-righteous proudly-proclaimed virgin who slyly positions herself to bring down Margaret. Without ever slipping into caricature, Johnson simply inhabits her villain. Johnson has been one of the region’s best actresses, especially when she has a good director... Someone needs to find more roles for this talent. There’s solid support, too, from Mason as the loyal sister and Anderson, who needs to be speak up a bit more, but who is heart-wrenching in her two scenes as the troubled mother. Gainey is a genial, winning actor, but he really only gives Luke a single note of benign and abiding affection. Cason is convincing as a dutiful, devout son chafing at his mother’s demands. The father-son scene between Cason and Gainey, fraught with yearning for connections despite a sense of estrangement, is another of those slice into the gut moments. Harrell keeps the show moving, even though it’s a long haul. He and the cast inject dozens of grace notes like the impromptu shouts and hand motions during the church service. 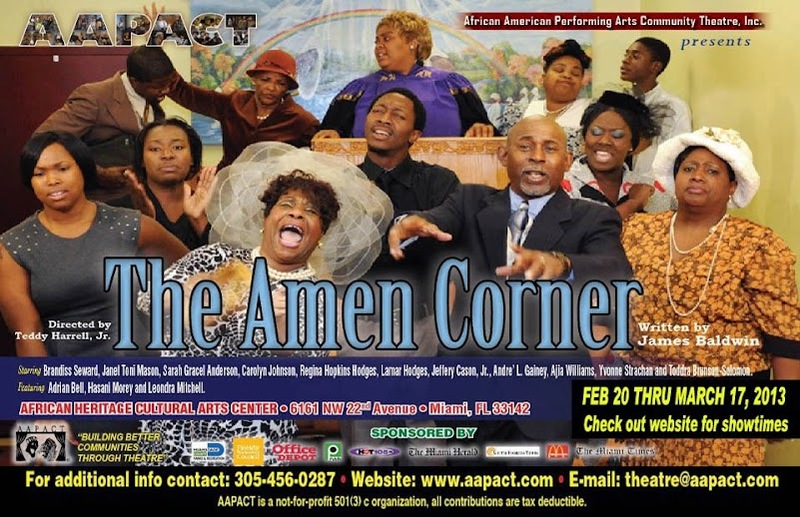 The AAPACT production of The Amen Corner plays at the African Heritage Cultural Arts Center through March 17.